Okay, call me crazy if you like as this will be number three of models that I will be working on. But as I haven't encountered any problems with this one, I will proceed with the build of the famous Bluenose. This while I wait for parts for the Syren and Solo. I guess this kit doesn't need any introduction or picture of contents. So I will leave that out, however I do have extra material that I will be using later while building her. This extra comes from Syren Model Company, with other word our dear Chuck Passaro. This kit was bought many years ago and the keel and bulkhead plywood is still straight. When I was putting the false keel pieces together it turned out so straight I was amazed. The plywood is very nice and very little sanding is needed to get the bulkheads into each slot. Creating the rabbet was not as hard as I thought. Just being careful at the bow where the rabbet is extreme. I pre-beveled the bulkheads so there will be less sanding once they are glued in place. This kit came amazingly with a stand. As usual pictures is now uploaded for your convenience. I have all the rigging line and blocks from our friend Chuck. 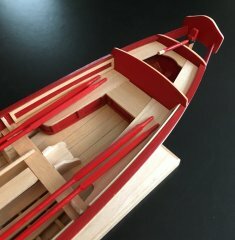 Paying attention and reading quite a few other Bluenose build log, I wanted to make sure that I didn't break the stern part. So the first thing I did along with dry-fitting the bulkheads was making sure I made blocks to insert in-between the sensitive parts. The material is just amazing and very nice to work with. Thanks to a perfect straight false keel (4 years old) the bulkheads got a perfect fit where the lego blocks was just an assurance for final perpendicular setting. What I forgot to do was the thin the bulkheads prior the installation of them. Doing so will eliminate and stress and breakage of bulkhead and false keel. But thanks to my great tool the micro saw, this was done without and damage. 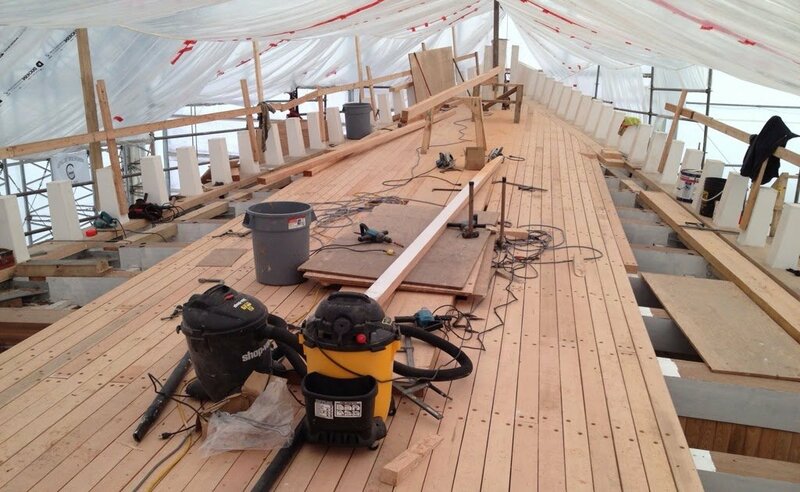 In order to find the right line for the hull planking the waterways is to be installed prior. Now when looking at the plans the beam and great beams needs to be installed before the waterway is in put In place. These pieces are to be installed on bulkhead H. If the waterways are installed before, you will not be able to get them in place. Both of these beams are really crucial as they will provide support for all deck planking. This is not mentioned in either the instructions nor the practicum from Mr. Hunt. Hey howya goin Per mate, good start, best of luck withya. Very nice and straight and aligned, that's a very good start, looking around its surprising how little attention some people put to this crucial step. Making sure everything is aligned right at the beginning means everything else will go on without any gymnastics. I also have Gene's practicum for references while building the kit. Great, let me know if you find anything wrong with it, I'll be following along. While shaping the waterways (one at the time due to space at the bow) I finalizing the shape of the stern. I'll come along on ship #3! Looking at pictures online from Bluenose II and how the foredeck is planked I started wondering if I could take another approach. Bluenose II only has two waterways. I don't know if the original Bluenose only had two or not. But what I recall, they build Bluenose II according to the original. Don't know if it will be possible with the kit. But this is certainly something for those that are building the later version of her as this will be accurate. The waterway is fashioned the same as we plank the hull. Once I have the these two planks in place I am to add on support at the bulwark stanchion extension, that hasn't been notched. This way I will have maximum gluing area for the waterways between the stanchions. Here waterway inserted between the bulkheads on the supports. Very clever clamps. I will adopt those the next time i plank! I did remember to do one thing before installing the second waterway. The beveling! Doing this once installed would probably be impossible. The beveling looks more like a rounded corner with the camera. Once installed I think it will be hard to see it. Hi Per, good to see you starting on this grand lady. I will be following along with interest. You have already done some things I wish I had thought of way back when. The support for the waterway between the stanchions, for instance. I recall fearing those guys wold just drop into the hull when I was installing them. I also recall rejecting the Hunt practicum for the installation of the great beam. Waiting patiently for your next step. She is coming along nicely so far! As for the installation of the great beams, it's mentioned to late in the instructions and in Hunts practicum almost forgotten this because he didn't use the laser cut parts. He used leftovers to create his beams. One more work day and then back to the yard and the the "lady". I should had beveled the waterway before bending the pieces. I wasn't happy how the waterway connected with the bulkheads, so I decided to rip them out and start over. Then starting comparing the notes from Bob's practicum and the plans, obviously Bob got it wrong. "Photo 2.1-1 shows a 3/32"x1/8" strip laid from the bow to the aft side of bulkhead H with the 1/8" width glued to the tops of the bulkheads." However, the plans from ModelShipway says something completely different. "This is the waterway, it is composed of 3 planks. The outboard plank fits between the stanchions. This waterway is thicker than the nibbing strake and the other deck plank. Use the 3/32" square ribs fot the two inboards strakes and 3/32"x1/8" strips between the stanchions." The instructions coming along with the kit doesn't say anything more than the thickness. You really have to pay attention. I am glad I ripped up the first planking as I used the 3/32"x1/8" for the two inner planks. Now I have to figure out which is the better way to go. What kind of banana is this? Waterways out! And nothing damaged! and that was my Bluenose. The bananas were the new waterway made out of 3/32" basswood plank. The plank was necessary to get the right width. Since I had a plank with the right thickness I made a single plank of 6/32", this to match the original Bluenose. It was tricky to get it right but now they are down and glued into place. And it looks amazing. Hope this can be inspiring to others. I will leave this to rest over the night. Looks to be a great start. Why do parts work better the second (or third or fourth) time around? Ripping parts off and starting agian, ah hell no, you should throw it in the bin and by a new one everytime . Could it be that the second or third we have thought through the process properly. Instead doing it the way we think it should be like according to the instructions. Once I have the blocks at the stern shaped, the waterways for the aft deck will be attached. I will do it the same way as with the fore deck. As I now have thought this through. My financial adviser wouldn't appreciate the investments over and over again. Besides it was an easy fix with material I already had in stash. I cut out the piece from the plywood sheet that held the false keel part and using it for the shaping. This way I will have some of the axis correct for final shaping. On the top of the blocks I used scanned part from the plans to get the port and starboard shape. Waterways installed, this time they are wider single plank just like the original. It took some effort to get it right but I am pleased with the outcome.